An adjustable sorting screen is mounted behind the rotor. The screen is made up of high tensile round bars which can be easily positioned to give spacings of between 1/2� and 2� for all requirements and conditions. The tines are protected from large rock damage by the fitting of shock absorbing spring assemblies. 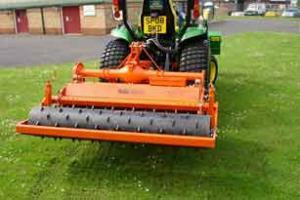 This machine requires a Tractor 20-40hp to operate which would be an additional hire. Please see tractor section for details.